Leading experts from all areas of plastic surgery detail the most current and effective therapeutic options for the full range of aesthetic and reconstructive challenges in the face, body, and extremities. They zero in on the succinct, detailed, and practical guidance needed to select the best approach for each situation, implement it effectively, avoid pitfalls and complications, and produce the most satisfying outcomes. Covers hot topics such as ·facelift · eyelids · breast reconstruction, reduction, and augmentation · liposuction · head and neck trauma · burns · dermatologic conditions · speech therapy · prosthetics · urogenital reconstruction · pressure sores · hand and wrist fractures and dislocations · salvage surgery · and varicose veins. 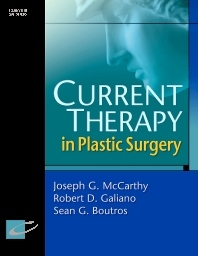 Includes chapters on non-surgical techniques such as botulinum toxin and laser skin resurfacing. Focuses on pragmatic, need-to-know information. Provides references to more comprehensive or specialized texts for further reading, where appropriate. Offers the editorial expertise of world-class authorities from the prestigious Institute for Plastic and Reconstructive Surgery in New York.